The ASP.NET Web Forms Tree Grid is a feature-rich control used to display self-referential hierarchical data in a tabular format. The ASP.NET Web Forms Tree grid is a feature-rich control used to display self-referential hierarchical data in a tabular format. Its wide range of functionalities includes data binding, editing, filtering, paging, freezing columns, row reordering, aggregation of rows, and exporting to Excel, and PDF formats. Tree Grid is designed and optimized for high performance. A high volume of data can be loaded without performance degradation by using row virtualization. The ASP.NET tree grid allows the user to perform scrolling and other actions without any lag even when dealing with large numbers of records. Tree grid provides support for create, read, update and delete operations (CRUD) on the records. Editing can be done in tree grid using different edit modes such as inline, dialog, and batch edit (cell editing). Along with built-in editor’s tree grid provides custom editors support for editing the records. The tree grid control also provides support for command columns and column validation support for validating the data. Paging is used to display the records in a paginated view in Tree grid, where only a segment of data can be viewed from the assigned data source. 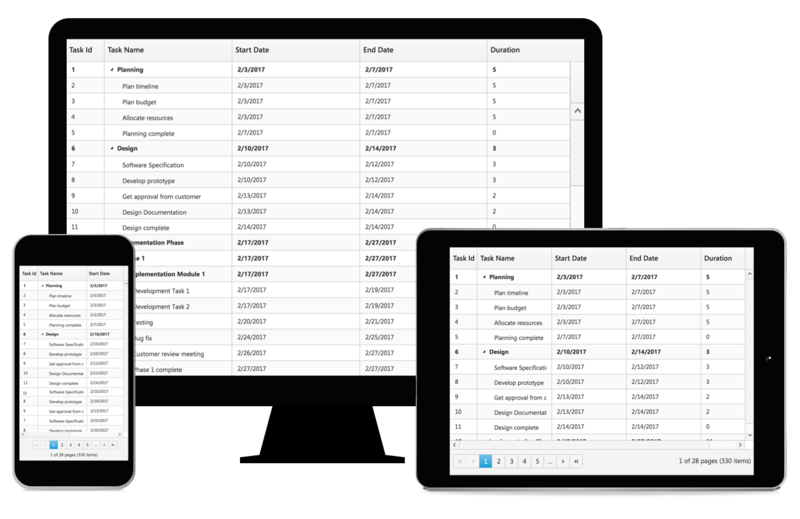 Paging is specifically designed in tree grid to view the hierarchical data in a paginated view. Tree grid offers built-in pager UI with options to customize its entire UI. It also has an on-demand paging mode for effective data retrieval from remote web services. The Tree grid rows can be sorted against a column simply by clicking the desired column header. Data can be sorted either in the ascending or descending order. Sorting can be applied to either single column or to multiple columns. Filtering allows users to view the required data in the Tree Grid. The Tree grid supports various filter types such as filter bar, menu, and Excel-like filter. The appropriate filter type can be chosen based on the application. These filter types support number filter, string filter, date filter, and Boolean filter. Options to customize filter operators, case sensitivity, filtering blank values are also available. Column defines schema of data source in Tree grid. Columns acts as base for all features. It supports formatting, auto generate columns, column definitions, and column resize, column reorder, column chooser, column menu and other important features. Tree grid supports to select rows or cells. One or more rows or cells can also be selected by holding Ctrl or Command, or programmatically. Check box selection is also available in tree grid with options to select the records with data hierarchy. Templates can be used to create custom user experiences in the Tree grid. The Tree grid provides various template options to create custom headers, custom cell contents, custom rows, detail rows, and toolbars. Export the Tree grid data to Excel and PDF files. Tree grid also supports wide range of customizations for PDF export.